Is the other driver trying to put the blame onto you by claiming that you were distracted while driving, which caused the car crash? Speak to Salt Lake City car accident attorney from Jardine Law Offices, P.C. Get a free consultation by calling at 801-350-3506. As much as we hate to admit it, smartphones and distracted driving are actually one of the leading causes of car accidents in the United States. If this sentence alone was not enough to encourage you to put away your phone and focus on the road, then consider the following statistics. In Utah alone, roughly 6,000 of all car accidents in the state are caused by a distracted driver each year. However, that figure is likely much higher, as it is not always possible to determine what the primary cause of the accident is, not to mention that many distracted driving accidents go unreported. Even though distracted driving results in more than 3,000 injuries and roughly 30 fatalities in Utah per year, it seems that the number of drivers using their phones while operating a vehicle keeps rising by the year. To tackle the ever-worsening problem, Utah lawmakers have introduced a series of laws designed to punish motorists for getting distracted while driving. “Don’t get me wrong, cell phones are arguably the most common reason why drivers get distracted behind the wheel of their vehicle, but there are also plenty of other activities that create a risk of causing a car crash in Utah,” says our Salt Lake City car accident attorney at Jardine Law Offices, P.C. Enter data into a handheld communication device. reporting a safety hazard or crime. 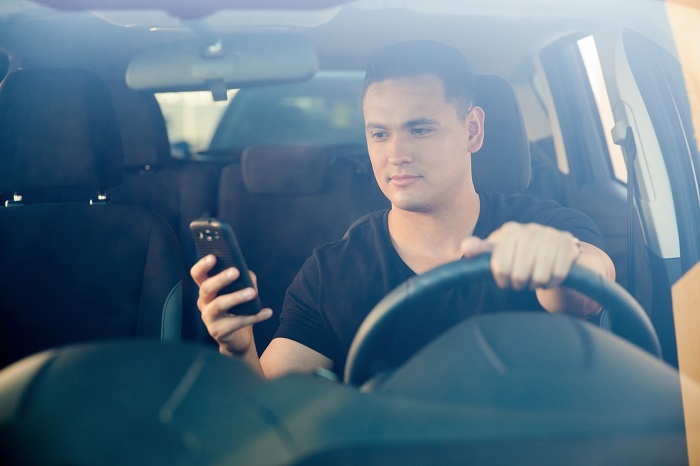 Violating Utah’s distracted driving laws can get you in trouble, as, at minimum, you risk being charged with a Class C misdemeanor punishable by a maximum fine of $100. “Yes, as you can see, there are plenty of distractions when it comes to operating a vehicle in Utah,” says our experienced car accident attorney in Salt Lake City. Changing a radio station, navigating GPS to get directions to a destination, adjusting the climate control, focusing on the cargo of the truck driving in front of you (instead of focusing on the road ahead), eating food or drinking while driving, driving with pets on your lap, checking on the children and infants in the backseat, and even talking to passengers can increase the likelihood of getting into a car crash by up to 80 percent. Now that smartphones have become an integral part of our lives, focusing on the road throughout the trip has become very difficult, and for some drivers, even impossible. Is the other driver trying to put the blame onto you by claiming that you were distracted while driving, which caused the car crash? Speak to our Salt Lake City car accident attorney from Jardine Law Offices, P.C. Get a free consultation by calling at 801-350-3506.